These Instagrammers shared their photos with The Daily Golden and had the most “likes”. Now we can level the playing field as I am sharing this with all Daily Golden readers. Please vote for the “Instagrammer” who posted your favorite photo! Thanks for participating! You can be more specific in the comments by mentioning your favorite photo. Everyone need a cute puppy pic in their IG gallery. Meet Jasper, our energetic #goldenretriever. He is now 2 1/2 but still as enthusiastic as a pup. Me: I'd like a bone for my dog please. Butcher: does he like a challenge? He got the challenging one! My mom is going on a 10 day vacation… Without me, and I have no idea. Please take a second and vote below. This video was made by Debbi McDonough of ( illusionfxslideshows ) It is a tribute to Ray Charles, the blind golden retriever. It’s a long one, and you might need some kleenex. Since there have been several search terms on my blog stats lately including “Adam Levine” “Dog” “Bones” I began searching the internet to try and answer that question and it looks like Adam got himself a “golden doodle” back in March of this year. 1) A breeder stating she sold one of her golden doodles to Adam Levine. Apparently he received the dog as a gift. “I sold this puppy to Adam Levine from Maroon and The Voice in March 2013. He supposedly got the puppy as a birthday gift after his beloved Golden Retriever Frankie passed away. I still have not seen any photos of him with the puppy, but I’m sure they will be surfacing soon! Come on Adam, we want to see your new puppy!! It’s it a coincidence that @adamlevine named his dog Bones? Only because Hart is not a good dog name. So there you have it. Evidence seems to show that Adam Levine has replaced his beloved golden retriever Frankie girl with a golden doodle…”Bones”. If you have any photos or information on “Bones” please share them in the comments. 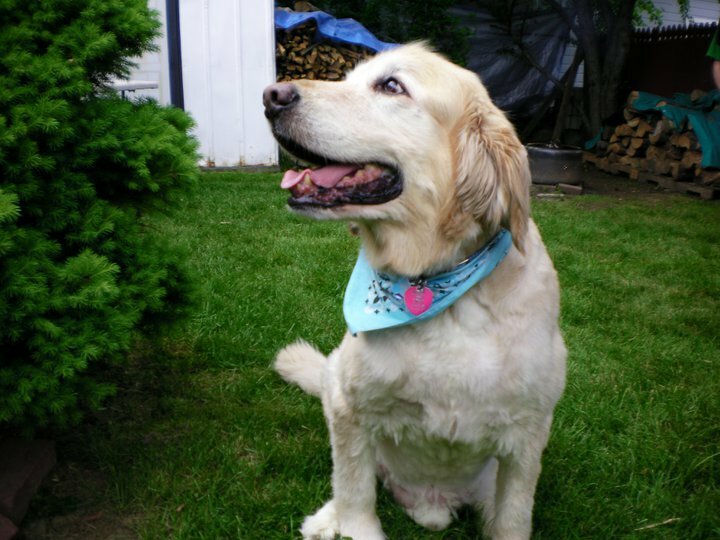 Absecon, NJ – On Saturday morning, Linda Nell and her husband Louis heard their 10 year old golden retriever, Chrissy, barking frantically. When Linda went to investigate, 2 pitt bulls barged through her screen door and began viciously attacking Chrissy. Linda and her husband Louis tried to get the dogs off of Chrissy. Louis fell on the dogs and also ended up being bit by one of the attacking dogs. Linda called the Absecon Police who arrived and shot one of the pit bulls. The other was taken from the home by Animal Control and reportedly has since been euthanized. Meanwhile, Chrissy lay dying in the kitchen. Her throat was slit open and she did not survive the attack. The owners of the pit bulls were not available for comment. One neighbor speculates that a rabid raccoon in the neighborhood is responsible for the behavior of the pit bulls. 73 year old Louis Nell is being treated for a bite on his arm and for rabies at their local hospital. 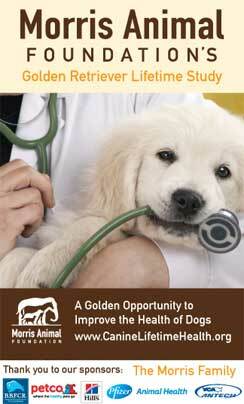 June’s Golden Retriever of the Month is Goldeny, who will be 2 years old on August 13, 2013. Like Comfort Dog “Prince”, Goldeny also appeared in her “sister’s” school Yearbook. Goldeny’s favorite toys are squeaky toys…and socks! Goldeny, in typical golden fashion, also loves to visit the beach! Her “human sister” has been working with her learning tricks. Goldeny participated in “Dog Idol” in “El Morro Pet Fest” activity and won 2nd place in the trick and obedience category.earlier this year. She is also an agility student! Here’s a video of Goldeny doing tricks with her human. It starts out with basic stuff, but by the end, her tricks will amaze you! Great job! Good luck to you Fabiola and Goldeny, in all your endeavors! Trenton, NJ – Chase “That Golden Thunder” has been a bat dog and fan favorite at Trenton Thunder games since 2002. He has been featured in CNN, ESPN, Sports Illustrated and many other media outlets. He will be 13 years old on July 3rd 2013. Chase will retrieve his last bat on July 5th at Arm and Hammer Stadium. Chase’s son, “Home Run” Derby will be taking his place full time. Well behaved dogs on a leash are invited to attend the game on July 5th against the Reading Phillies at Arm and Hammer Stadium to celebrate Chase’s birthday and retirement. The first 2000 fans over 14 will receive a Chase Bobblehead! Click here for details. Have a wonderful retirement Chase!